After a long day, I’m currently on the train back to Leicester after attending YMS 2018 with Student Hut! After answering some survey questions for the Student Hut back in December (link’s here), I was invited to participate in a live student panel along with a few other students at the Youth Marketing Strategy (YMS) Conference! After arriving last night, I began this morning at 8am with the panel due to start around 9am. Myself and the other students were briefed on the kinds of questions we’d be asked before we headed on stage to a packed audience. I was quite surprised to see so many people there for such an early start, but I had to remember that we (as students) are a large part of their target audience. We all started off a bit nervous since we weren’t even sure the mics were working. But once we’d all spoken, the answers flowed much easier. 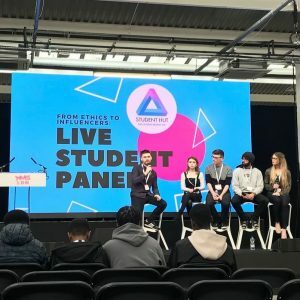 Eddie (our lovely question master and member of Student Hut’s team) asked us questions about what social media’s we used the most, whether we considered the ethics of a brand when purchasing, whether we followed any celebrity influencers and a number of others. Eddie asked us about our opinion on Virgin Train’s avocard offer, to which I wholeheartedly admitted I’d never bought nor eaten an avocado and questioned why they couldn’t have used a cheaper fruit. Definitely the nerves coming out in a terrible joke. What was particularly interesting was all but one of us on the panel admitted that we’d probably delete Snapchat if we had to choose which social media to delete from our phone. I think the reason why we all agreed without discussion was because Snapchat in itself is very limited as a social media – its story feature is available on Facebook/Instagram and the advertised content can be found almost anywhere. If you’re really interested, my face and tweets are plastered all over Student Hut’s & Voxburner’s (the event organisers) twitter pages. For much of the remainder of the day, I sat in for a few talks, helped out on Student Hut’s stand or played Mario Kart! I learnt some pretty insightful stuff on how ITV made Love Island so successful last year, and I’m pretty sure I beat everyone at Mario Kart. Just wanted to thank the team at Student Hut for being amazing hosts and making me feel so welcome the whole time I was in London. It was a really great opportunity and I’d be so happy if they asked me to work with them again! If you want student reviews about student life, check out Student Hut’s website here! They literally review everything, so there’s no worrying if the Quidditch society is all it’s cracked up to be!